Our newest board member + brilliant chef, Robin, shared this recipe featuring goat from Lucky George Farm. Robin says mutton, goat, or beef all work Give it a try! Mix the ground meat, egg, onion powder, garlic, salt, pepper, and Worcestershire sauce in a medium bowl. Form 4 equal size patties and refrigerate until ready to use. Note: for even more flavor, make the patties several hours before cooking. For the sauce, heat a medium size skillet over medium heat. Add the pancetta and sauté, stirring occasionally until the pancetta is crisp. With a slotted spoon, transfer the pancetta to a paper-towel lined plate. Increase the heat to medium-high and add the mushrooms. Sauté, stirring occasionally until the liquid released by the mushrooms evaporates and the mushrooms are browned – about 8 minutes. Add garlic and shallot, sauté for 1 minute longer. Return the pancetta to the pan and add the tomato paste. Stir while sautéing, until the the tomato paste begins to brown. Add the Marsala wine to the pan, increase the heat to high and simmer vigorously, scraping brown bits from the bottom of the pan until the sauce is syrupy and reduced to about 1 1/4 cups – this will take anywhere from 5 – 10 minutes. Stir in the lemon juice followed by the butter. Keep the sauce warm, over low heat while cooking the burgers. Slice and lightly toast the cut side of the ciabatta rolls. Grill or pan fry the burgers until cooked through, about 3-5 minutes per side. 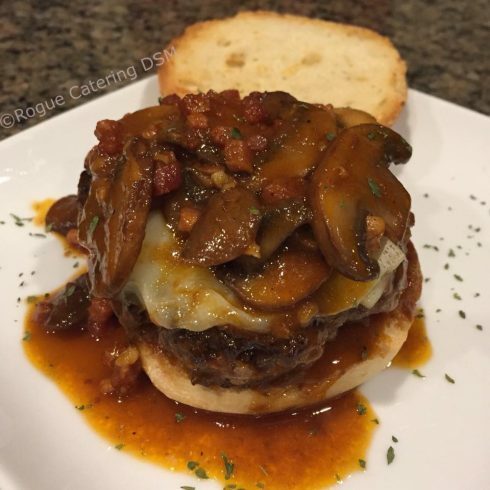 Place a slice of provolone cheese on each burger and allow to slightly melt. Serve the burgers on the ciabatta rolls, spoon sauce over each burger and enjoy!